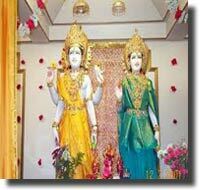 Lakshmi Narayan Mandir is situated in the west of Connaught Place in Delhi. The temple was constructed by Raja Baldev Das in the year 1938 and has been dedicated to Lord Vishnu and Goddess Lakshmi. 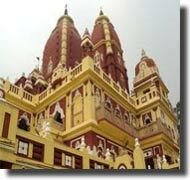 The temple is also known by the name of Birla Mandir of New Delhi . The Birla Mandir has quite an interesting history attached to it. The temple was built over a period of 6 years and got inaugurated by Mahatma Gandhi. But Mahatama Gandhi inaugurated with the condition that the Delhi Laxmi Narain Temple should allow people from all castes, especially untouchables. The temple constitutes of one of the major draws of the city and is visited by numerous devotees and international tourists every year. Lakshmi Narayan Mandir has been built magnificently although with a modern touch. The Temple is adorned in the interiors with beautiful carvings depicting the scenes from mythology. There are Numerous Hindu symbols and quotes from the Gita and the Upanishads ornament the temple walls. There is also highest Shikara (tower) in the temple which soars to an altitude of 165 ft, while the ancillary one which is about 116 ft. facing east and standing on an elevated platform. Birla Mandir of Delhi also enshrines the holy Vedas. The main shrine is dedicated to Lord Narayan and Goddess Lakshmi, while the smaller ones to Lord Shiva, Lord Ganesha and Lord Hanuman and Goddess Durga. The Geeta Bhavan, a hall is adorned with beautiful paintings depicting scenes from Indian mythology. There is also a temple dedicated to Buddha in this complex with fresco paintings describing his life and work. The entire complex, especially the walls and the upper gallery are full of paintings carried out by artists from Jaipur in Rajasthan. The uniqueness of the temple is that an artificial mountainous landscape with fountains and waterfalls has been developed around it. Geetha Bhawan is to the north of the New Delhi Laxmi Narain Temple, which is devoted to Lord Krishna. Devotees also have the chance to visit the Buddha temple in this temple complex, adorned with murals describing his life and work. All the statues in the Birla mandir are made up of marble and were brought from Jaipur. Miniature rock temples, which dot the temple, hold a special attraction for the children. The splendor of the temple is enhanced by an artificial landscape in the back, with mountains and cascading waterfalls. The festival of Janmashtami, the birth anniversary of Lord Krishna has a great significance to the temple.The temple, built in Orissan style, has a large number of idols representing various gods of Indian pantheon. The well-crafted gardens need a special mention. 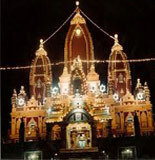 Birla Mandir is also famous for the festival of Janmashtami (birth of the Hindu deity Krishna). The festival is celebrated here with much goodwill and cheer. The temple is designed in the Orissan style, with tall curved towers capped by large amalakas (circular ribbed motif at the summit of a temple tower). The exterior is faced with the white marble and red sandstone typical of Delhi's Mughal architecture. The interior court is with the two-storey verandahs on three sides; there are gardens and fountains at the rear. The profusion of sculptures, idols, spires and jalis, the Birla Mandir in Delhi is also considered as a splendor in terms of its architecture. The Laxminarayan Mandir remains open on all days of a week and visiting time is 7 am-12 am and 2 pm-9pm. The best time to visit Delhi is between February and April or from August to November. The weather at this time is quite pleasant. Summers in Delhi can be hot with temperatures rising up to 45 degrees while the temperature dropping down to 5 degrees in winters. Accommodation is available in the Birla Mandir guest house for out of town travellers especially for international scholars pursuing knowledge in Sanskrit or in the Hindu religion. Many International scholars usually come here to learn about the Hindu religion and for the time, they usually stay in the guest house of Birla Temple. 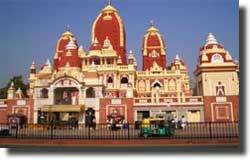 The sacred Lakshmi Narayan Temple is situated on Mandir Marg, 1.5 km due west of Connaught Place. Tourists have got multiple transportation options to reach the temple. It is easy to reach Shivaji Stadium or Talkatora Gardens from all parts of the city, and then hire an auto rickshaw to visit the Birla Mandir. Entry is free but you might have to shed a few bucks if you want to go for some 'Puja' (religious ritual) inside the sanctum sanctorum. The temple is open from sunrise to sunset and the dates of religious ceremonies can be seen at the Mandir's office.